You can place these wherever you want to show the files. 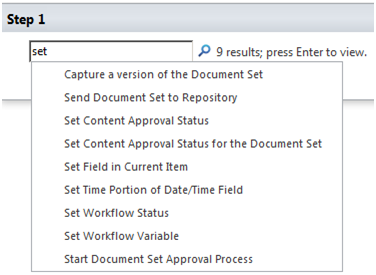 While using Workflows in SharePoint designer 2010, I wonder what an Impersonation step does. Impersonation Steps are placed in the workflow in the same way that we would use regular steps. They have conditions and actions within, just the same. But the difference is the actions within the Impersonation steps will run as if it were the identity of the user who authored the workflow. That means: Using this feature gives the users of the workflow rights they wouldn’t normally have. They may be able to obtain list items actions to a list they don’t have rights to. Some action in SharePoint designer just runs under the elevated privileges of the Impersonation Step. For example “Check list item permission levels” and “Check list item permissions”. Scenario 1: You have 2 lists. User adds some information in list A and you want WF to create/update some list items in list B without using user’s permission to list B. If user doesn’t have permission to list B, the workflow will fail. By using Impersonation steps you can solve this issue. Workflow will add information in list B even user don’t have access.